There are currently 75 people online. OWC has released five new models in its Mercury Elite Pro Dual Mini “Quad Interface” Portable RAID storage solutions line. 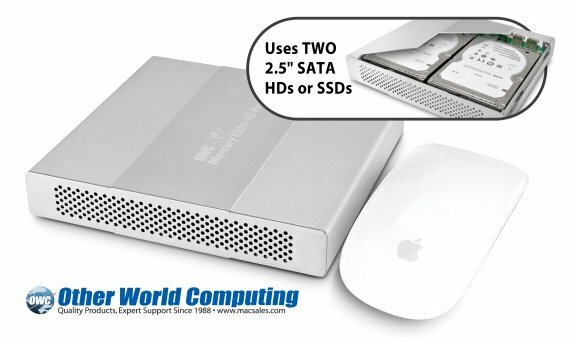 Other World Computing (OWC®) http://www.macsales.com, a leading zero emissions Mac® and PC technology company, announced today it has expanded the new Mercury Elite Pro Dual mini bus powered (no AC adapter needed) portable hardware RAID storage solution with two new hard drive and three new OWC SSD based models. Now offering 10 pre-configured choices with hardware RAID-1 “mirrored” redundancy for “live activity” data protection; or RAID-0 “stripe” for maximum performance capacity, the Mercury Elite Pro Dual mini contains two 2.5" hard drives or OWC Mercury Electra 6G SSDs (http://eshop.macsales.com/shop/SSD/OWC/Mercury_Electra_6G/) for up to 2.0TB of capacity and a “Quad Interface” of FireWire 800, FireWire 400, USB 2.0, & eSATA connections for Plug and Play data transfer speeds up to 300MB/s with Mac and PC computers. All 10 Mercury Elite Pro Dual mini models are available immediately from OWC at http://eshop.macsales.com/shop/firewire/EliteALmini/RAID/eSATA_FW800_FW400_USB and are compatible with Apple OS 8.6 and later including all versions of Apple OS X including the latest Lion version; and Windows 98SE or later operating systems. Solutions come ready for Plug and Play ease of use with interface connecting cables, include a $100 retail value disk utility software bundle (http://eshop.macsales.com/shop/solutions/software_bundle/), and come backed by a three year complete solution warranty with Level 1 Data Recovery service. Measuring the approximate size of a portable CD player - 5.6" (D) x 6.1" (W) x 1.1" (H) - the bus powered (no AC adapter needed) Mercury Elite Pro Dual mini’s unique flat side by side two drive design enables it to fit into laptop, photography, and other gear carrying bags easily and without adding any bulk. With 10 models offering two 2.5" SATA hard drives with up to 2.0TB of capacity or two award-winning OWC Mercury Electra 6G SSDs with up to 960GB of capacity, the Mercury Elite Pro Dual mini delivers big storage performance in an under two pound, fanless solution. The Mercury Elite Pro Dual mini comes conveniently factory set for Plug and Play use in one of two RAID levels: RAID-1 for writing the same information in real-time to two matched 2.5" SATA drives up to 1.0TB for “live activity” data redundancy; or RAID-0 for “striping” data up to 2.0TB across both drives for the highest performance capacity backup. Users that desire a change to either RAID level setting, including the SPAN option, can do so easily via switch selectors. With a “Quad Interface” of two FireWire 800, one FireWire 400, one USB 2.0, and one eSATA ports and high quality connecting cables included, the Mercury Elite Pro Dual mini doesn’t require any complicated set-up and is ready for Plug and Play use with legacy Macs, the latest 2011 Mac models, and PCs. It provides data transfer speeds up to 300MB/s and can be moved between different systems utilizing its supported interfaces with complete interoperability for maximum data backup performance and flexibility.